New book: Mills, David L. Network Time Synchronization: the Network Time Protocol on Earth and in Space, Second Edition. CRC Press 2011, 466 pp Russian translation: ISBN 978-966-97191-0-2. I have been retired since September 2008, but continue to do mischief as an Adjunct Professor with occasional teaching and funded research projects. My latest project is the second edition of my book cited above. My research interests include computer internetworking systems, especially time synchronization technology. I have participated since 1977 in Internet technology development. My sponsors include the National Science Foundation (NSF), Defense Advanced Research Projects Agency (DARPA), US Navy, US Army and NASA Jet Propulsion Laboratory. I teach graduate courses in computer networks, computer security and the mathematics of cryptography. 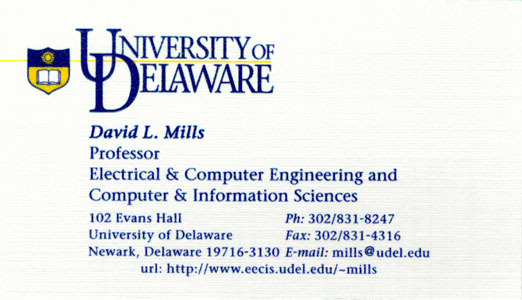 I also teach undergraduate courses in computer architecture, electronic circuit analysis and analog/digital communications. I am a member of the National Academy of Engineering. I am also a Fellow in the Institute of Electrical and Electronics Engineers (IEEE) and the Association for Computing Machinery (ACM). I received the IEEE 2013 Internet Award. Please note this site has been especially designed to aid folks with low vision, which includes me. With Internet Explorer 5 and beyond you can change the font size for every page and every link using the ctrl-mouse wheel. For other browsers the font size can be changed in the preferences menu.